At $8.12 each your 1923 half dollar value is the minimum a heavily worn coin is worth. It is tied to today's silver coin value. These old silver half dollars are valued depending on the amount of wear. Your coin is part of the early years of the Walking Liberty series, and not commonly found. However the all important consideration is condition. Collectors have many of these 1923 half dollars available to add to their collections, although most are worn and unappealing. The challenge is finding one in high end condition. Well preserved examples are few and trade at a large premium. Examine closely all of these early half dollars as to wear. Collectors refer to it as "grading" your coin. 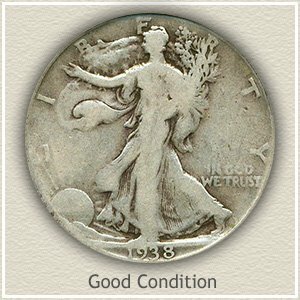 Images of half dollars in different stages of wear are further down the page. The descriptions and comparing your coins to these images gives you an idea of its condition. Next checking the value chart shows how much a 1923 half dollar is worth. All 1923 half dollars were minted in San Francisco. The other two mints, Philadelphia and Denver did not produce any half dollars in 1923. Your coin has a small "S" struck into its design, indicating the San Francisco mint, it is located on the reverse close to the rim. Seldom available in choice condition, 1923 half dollars when auctioned are avidly sought. 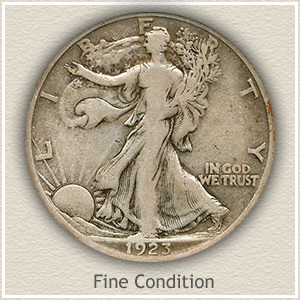 Walking Liberty collectors and dealers are well aware of the scarcity of this coin. The attention given to the one pictured drove the bidding at a David Lawrence Rare Coin auction to $3200 - a strong price. An unusually bold strike and luster, with surfaces devoid of marks places it at the very top of quality available. Knowledgeable collectors assembling sets and desiring gem silver half dollars bid aggressively. The new owner rightly admires their purchase. Your coin may not be as outstanding or valuable, however all 1923 halves need careful examination. Higher value is often found in subtle differences in small amounts of wear. Collectors assembling a set of Walking Liberty halves strive to add high quality examples to their collection. Generally fewer of these old silver half dollars survive in better condition, as a result these nicer coins are worth more. To accurately place a value on yours, each is judged and a "grade" is resolved. Dealers and collectors both use the terms found below. 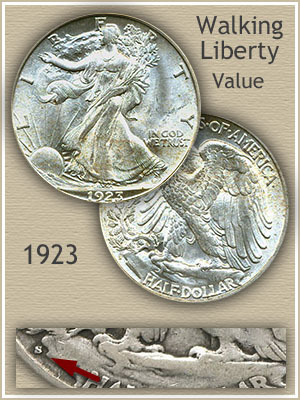 Compare your coin to the images and descriptions, finding the grade and 1923 half dollar value. 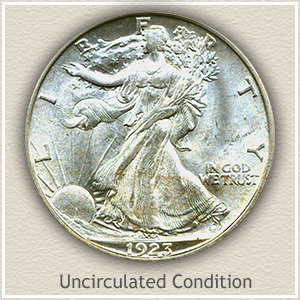 Uncirculated: If your coin was put away long ago before any wear from circulation took place it is in "uncirculated" condition and at the top of 1923 half dollar value. Typically toning has begun to cover parts of the coin, but the original luster is unbroken by wear. Examine Liberty's outstretched arm and rear leg, if the luster is missing because of wear thus indicating the coin is circulated, these areas appear dull. Fine: Wear has taken its toll and merged parts of the smaller design elements of a coin in "fine" condition. In the center where Liberty's left arm is holding the branches, the majority of the separation has disappeared, leaving an indistinct flattened area. Loss of metal has reduced the sun's rays, some are just barely visible or absent. In fine condition your 1923 half dollar is still above its silver coin value. Good: Heavy wear and overall flatness to the coin define the "good" condition. Rims have begun to connect to the tops of the lettering and starting to obscure the date. Areas of "In God We Trust" are becoming faint. The center of Liberty is flat with no details. 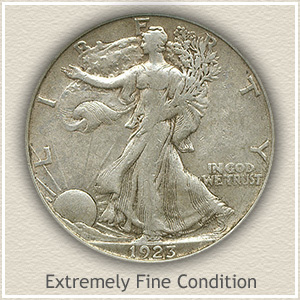 In this condition the typical 1923 half dollar value is based on silver content. Return to Coin Values Discovery... find 1923 half dollar value and... It is an excellent index with images and text links to all coin series, from Cents to Gold. Value charts, grading images and descriptions uncovers the common to rare coin values found in your box of old coins.